On June 11, the Reverend Mary Edwards, of the village of Collingbourne Ducis in the UK, demanded that all members of her parish report to the village recreation ground for archery practice as required by a medieval law that has never been repealed. Or at least that’s what she claimed. "It's an unrepealed law from some time in the Middle Ages," said Rev. Edwards, "and I can call all the men – but I've extended it to all people – in the parish to archery practice." This is where I started to get suspicious, because even if this law were still in effect, I doubted a local reverend would have the right to extend it unilaterally. While I am always happy to see somebody invoking an unrepealed medieval law, and I have no problem with archery in general, the research she cited did not seem especially ironclad. And, in fact, it appears that the archery requirement was repealed quite a while ago. While I would have preferred to fly to England and go rummaging through the Parliamentary Archives to confirm this personally, I had a deadline to meet, plus I am not especially welcome there anymore because of what I see as a simple misunderstanding as to whether their reading rooms are clothing-optional. So I have relied on the Internet, which is less authoritative but also less judgmental. It is clear that there were laws requiring archery practice dating back to at least the 13th century. 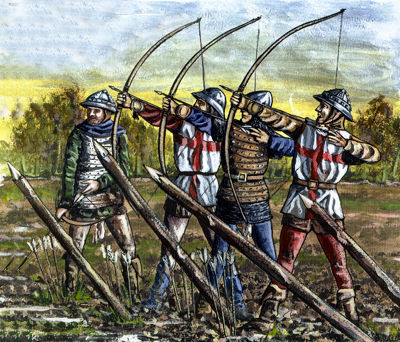 The motive was to make sure England had enough men trained to use the longbow, which for centuries was a crucial weapon for the English. (The most famous example is Agincourt, a battle that Henry V won in 1415 and is still going on about.) The training requirement was usually combined with prohibitions on other kinds of games and sports so that people would focus on archery instead of, for example, "tennis, football, [quoits], dice" and other "games inappropriate." 12 Rich. II, c.6 (1388); see also 11 Hen. IV, c.4 (1409) (adding handball to the blacklist). The point was not so much to condemn games as to make sure they did not get in the way of longbow training. In other words, they saw nothing morally wrong with tennis, it’s just that it is hard to kill a French knight with a tennis ball, no matter how good your serve is. In 1511, the requirement was expanded by “An Act concerning Shooting in Long Bows,” even though by then the importance of the bow was declining. 3 Hen. VIII, c.3 (1511). This law provided that "All Sorts of Men under the Age of Forty Years shall have Bows and Arrows" and practice using them. The playing of games continued, however, and in 1541 the law was expanded yet again by "An Act for the Maintenance of Artillery, and debarring unlawful Games," the preamble to which declares that said games were believed to be the "Cause of the Decay of Archery" skills in England. 33 Hen. VIII, c.9 (1541). (There was another very important cause by then, namely guns – or, more specifically, bullets – but games always seem to get blamed for social problems.) The archery requirement was extended to all men under 60, and the list of banned games was expanded. As before, though, these restrictions did not apply to the aristocracy. They tended to become knights, not archers, plus they had the God-given right to play games if they liked. According to them, that is, not God. At least some of this was still on the books well into the 19th century, but was probably repealed during the reign of Queen Victoria. In 1845, "An Act to Amend the Law concerning Games and Wagers" repealed any part of King Henry’s 1541 law making any “Game of Skill” unlawful or “which enacts any Penalty for lacking Bows or Arrows . . . or which regulates the making, selling, or using of Bows and Arrows . . . .” 8 & 9 Vict., c.109 (1845); see also Statute Law Revision Act, 26 & 27 Vict. c.125 (1863) (repealing the 1511 law). If any of the older stuff survived, it was most likely repealed by more recent acts intended to get some of the ancient stuff off the books. See, e.g. Statute Law (Repeals) Act 1969, c. 52 (repealing laws dating back to 1297). So, while I could not definitively resolve this because of The Reading Room Incident, it appears that Rev. Edwards’ parishioners were not legally required to respond to her summons. I believe that, under other possibly unrepealed laws dating back to Henry VIII, the villagers now have the right to confiscate all church property and to declare themselves divorced. Rev. Edwards did not impose any penalty for not showing up, and in fact those who did show were rewarded with a barbecue. So no harm done, and England is probably at least a little safer now, just in case the French ever become threatening again. But, eventually, Rev. Edwards admitted that the defense of the realm was not the primary goal of the event. "We are celebrating the building of a new loo in the church," she said. Surely the parishioners would have come out to celebrate that anyway. Note: This item previously appeared (without citations) on Forbes.com, for which I am now writing a weekly column that strangely enough is also called "Lowering the Bar." Those columns will show up here a week after they first run. This column on medieval archery law was my first one for Forbes and, surprisingly, not my last.